Their first film I can do that came runner up in the short film category at the Kendal Film Festival 2007. It toured the UK in the Best of Kendal film tour and they were specially invited to introduce it when it was shown at the Royal Geographical Society, London. It was also shown at select film festivals around the world in 2008. Two women set out with two aims: to reflect upon and discover what draws them to big mountains and to get down as quickly as possible - one on skis, the other on a bum board. But the raving winds on Cho Oyu in 2008 means their time is less spent philosophising and skiing and more surviving physically, mentally and spiritually. 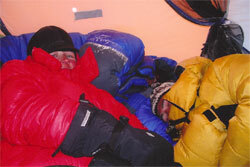 See how their humour and various base camp toys help them to cope with the ridiculous conditions, as they hope to achieve a five year dream to climb and ski an 8000m peak. The dream of the Lipstick Blondes expedition to ski 7500m Mustagata was to combine their passion for adventure with their love of laughter. 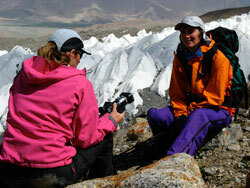 New to filming and cameras the aim to demystify big mountains met with fun, commitment, hardship and tragedy.